As I was exploring the rocky shoreline of west of Maui I found the most amazing cave I have ever seen. A large cavity formed perfectly into the rocky shoreline, which was filled with a bale of green sea turtles. The opening of the cave lined up perfectly with the sun. 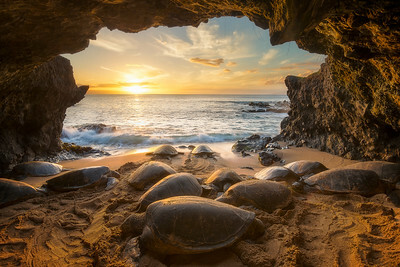 At sunset a soft orange glow filled the inside of the cave, reflecting a warm light on the wet shells of the turtles. And just as the sun was about to fall below the horizon, a pair turtles decided to make their way back to the ocean. A perfect moment captured in time. 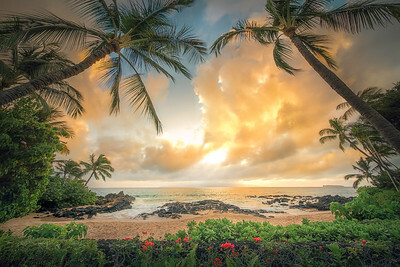 A glowing sunset on the dreamy shores of Kihei Maui. 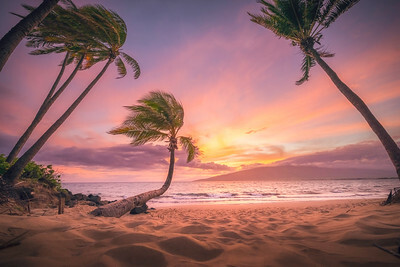 Pa'ako Beach, is affectionately known by locals as Secret Beach for the fact that it is hidden between two large homes in Makena, Maui. Thanks to its picturesque landscape, Pa'ako Beach has become a favorite location for beach goers and a popular place for wedding ceremonies. On any given day this tiny cove is filled with people. It was to my surprise when I arrived near sunset that I was the only one there. What was even more amazing was the breathtaking sunset that unfolded before my eyes. 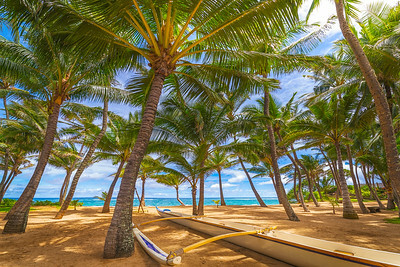 Having the entire beach to myself, I seized the opportunity to do a panoramic picture capturing the full beauty of Pa’ako Beach uninterrupted. Along the beautiful drive of Maui's Pali Highway, kiawe trees fill stretch of the coastal road. I've driven past this lone kiawe tree many times with out a second thought. One day during high tide I notice this tree on my way to Lahaina, it looked as if it was growing straight out of the Pacific Ocean. I went back for several weeks during high tide to photography this three. It is a very simple shot, however it took many attempts before I got a picture that I liked. 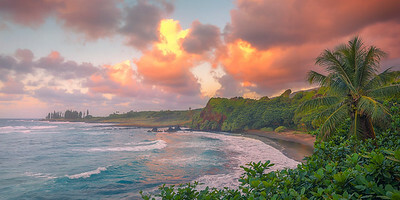 Daybreak fills the air with a radiant glow on the shores of Hana, Maui. Palm trees sway on the breezy North Shore, in front of the famous Mama's Fish House restaurant. Sunset at Maui's famous Kaanapali Beach. 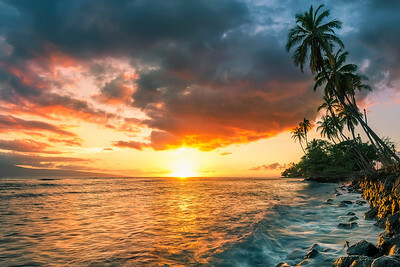 A warm sunset reflects off of the gentle shore break, as palm trees sway gently with the trade winds. Front Street, Lahaina. A few years ago Makena Golf Course closed its South Course, keeping only a few holes maintained for aesthetic purposes. Hole #15 on the South Course is lucky one of the holes still being maintained by Makena Golf. The view from this hole is absolutely amazing, it is one of the most beautiful holes in the world. A warm glow from the tropical sunset blankets the entire Napili Bay. 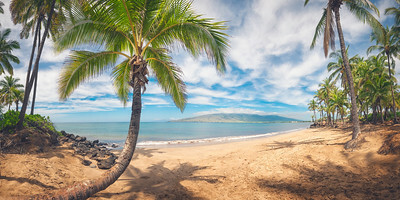 A sunny afternoon on the shores of Kihei, Maui. 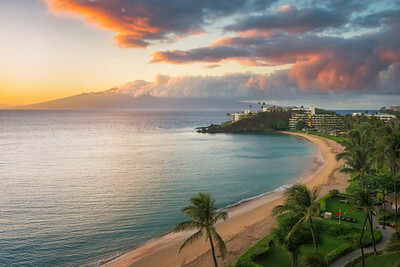 Aerial image of one of the most amazing beaches on Maui, Kapalua Bay. This picture has been a month long weekend project for me. 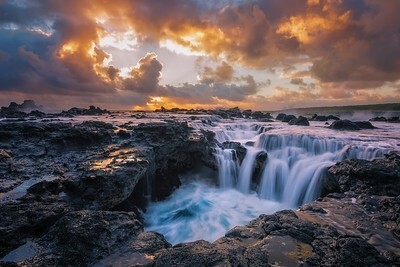 I've been getting up before the crack of dawn and making the trek down to the south side of Maui, all in the effort of capturing a panoramic sunrise of this small cove. After many disappointing sunrises, the weather finally cooperated and a beautiful pink glow appeared near the horizon. I was able to capture a few shots of this moment before the color disappeared. 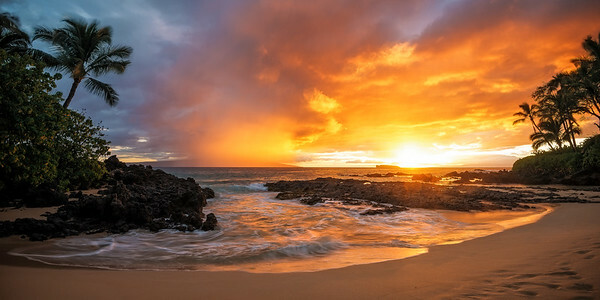 This is the sunrise at Secret Beach, Maui. This is one of the last images of the torch lighting ceremony that was held nightly at Black Rock in Kaanapali. Since this image was taken the lighting ceremony has stopped indefinitely. 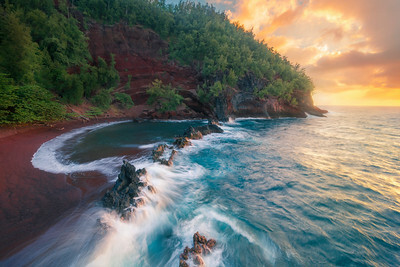 Morning glow radiates a seclude red sand beach on the island of Maui. Maui has some the most amazing shorelines in the world. Of course Maui has some spetacular white sand beaches but there are also black sand beaches, jagged lava rock shores, and steep cliffs. 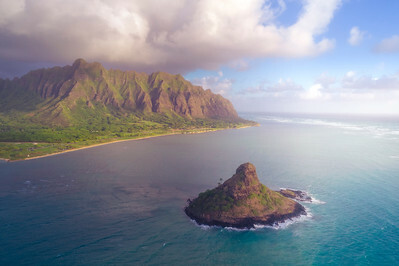 If you have ever driven from the Kahului Airport to Lahaina you would have likely seen all the shorelines mentioned above. Here is a picture I captured on the road to Lahaina of a toppled kiawe tree. 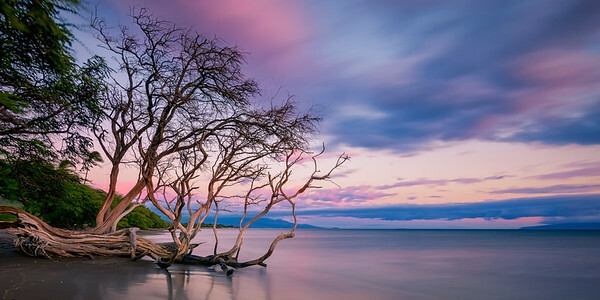 Its branches stretches across a black sand beach as a pastel colored sunset illuminates the sky. 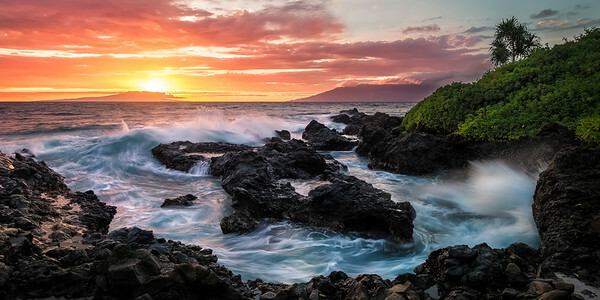 The sun sets over the island of Kahoolawe, illuminating shore break on a rocky cove in Wailea, Maui. 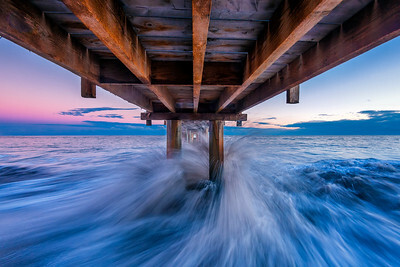 Out of all of the pictures I have taken to date, this image is the most difficult location I have ever shot. 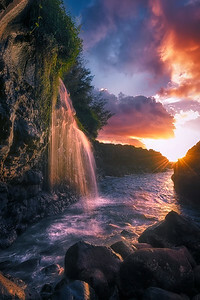 It is not just because of its remote geographic location on the island of Kauai but also because of the bad weather conditions I was faced with, the unfamiliar territory, the short time constraints to shoot, and the weird noises coming from the bushes as I hiked in the dark to catch this sunrise shot. 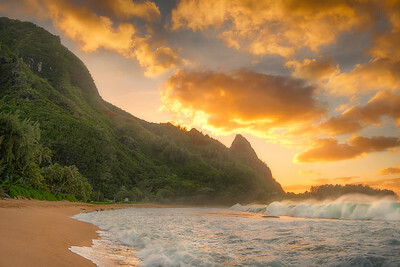 Kauai Hawaii at sunrise.